Tasty way to use your (homemade) sauerkraut. Sauerkraut has lots of health benefits, besides that it's also virtually fat free. Fry the onions in the sunflower oil until softened. Add cinnamon, sauerkraut and beer, cover and simmer for about 25 minutes. If you are using tinned beans, rinse them under cold water. Puree the beans and season with salt and pepper. 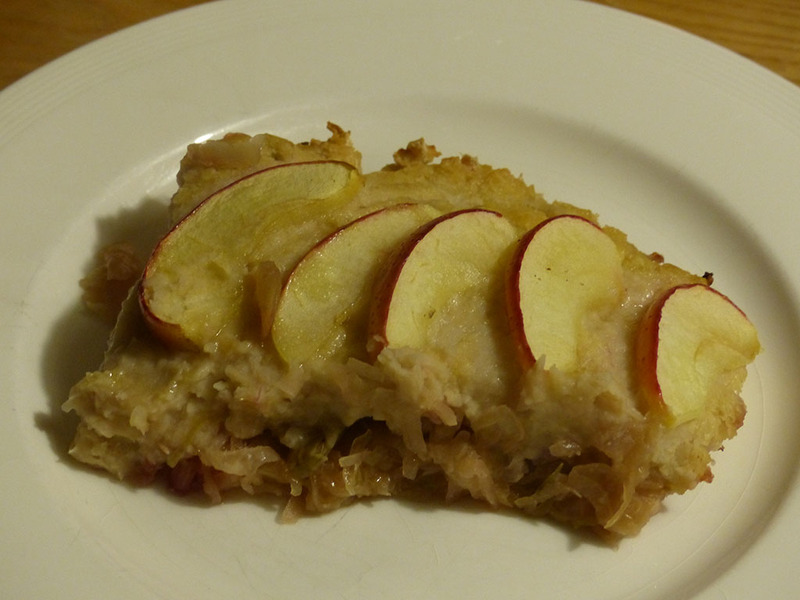 Using an oven dish layer the sauerkraut, then layer three quarters of the apples, then smooth over the butterbean puree, then on top layer the rest of the apple slices. Melt the butter or margarine and drizzle on top of the apples. Top with more freshly ground pepper. Cook for 25-30 minutes in a 200C oven. Note: all ingredients apart from the lager beer are gluten free. You can find gluten free beer in any health food shop with an alcohol license (sadly we don't).